Teach English Anywhere In The World! The INTESOL 150 hour Online TESOL Certificate contains a high quality academic content and is not only respected by employers, but also provides the perfect platform from which to begin your English teaching career. The 190 hour Certificate in TESOL includes 40 hours of onsite or online observed and assessed teaching practice, which means you can earn a CELTA/Trinity equivalent qualification with much more flexibility. Study the theory online in your own time and then attend one week of onsite teaching practice at a choice of centres at a time that is convenient for you. Alternatively, you cangain the same teaching practice experience online! Get your internationally recognised TESOL certificate with teaching practice without having to give up 4 weeks of your time! Why THIS online TESOL course? You can study this TESOL course online from your desktop, laptop or mobile device whenever and wherever you want. There are no set start dates and no time limit. You have the freedom and flexibility to fit your TESOL studies around your lifestyle. You can even study on the beach! INTESOL Worldwide has been training TEFL/TESOL teachers for 25 years and is well known and respected in the TEFL/TESOL industry. This means your TEFL/TESOL certification will be instantly recognised internationally as being of excellent quality. The 150 and 190 Hour TESOL course is externally accredited, meaning the content and teaching methods have been scrutinised externally to meet industry standards. This means you can be sure you’ll participate in a fruitful learning experience. Your tutor will be an experienced teacher holding a Diploma in TESOL as a minimum qualification (many have a Masters in TESOL). They will offer you all the support and feedback you need to succeed to the best of your ability. INTESOL Worldwide has a strong network internationally with branches all over the world, including Japan, Iran, Nicaragua, Russia and many more. Not to mention the multitude of relationships we have developed with EFL schools and recruiters in TEFL/TESOL employment hotspots. We’re well placed to help you find the best teaching jobs. The 150 and 190 Hour Certificate in TESOL online course is accredited by ALAP (Awarding Language Acquisition for Professionals), a UK based Awarding Organisation. ALAP is an accrediting organisation that specialises in the ELT industry. ALAP is supported by an esteemed Academic Panel who are all experts in the field of English Language Teaching. The ALAP panel oversee matters related to academic quality, ensuring that the value of an ALAP Certificate is upheld. For the 150 and 190 hour INTESOL Certificate in TESOL, the overall aim is to provide a thorough course which includes a balance between the theory, methodology and practice of Teaching English to Speakers of Other Languages and to thoroughly prepare our trainees for teaching in any overseas environment. This course is open to those with a good academic background, usually graduate status; qualified teacher status, or at least 2 ‘A’ levels or equivalent. If you are unsure of your eligibility please email the admissions team at info@intesolworldwide.com. Within twenty four hours of enrolling in your online TESOL course you will receive your login details for the INTESOL Online Campus. The course consists of five units (a total of eleven modules). Each module has a lesson that you will study at your own pace and an assignment that you will submit for grading by your tutor. When your assignment has been graded you will receive a notification by email and be able to view your grade, plus any guidance and feedback, in your online grade book. The grade book allows you to easily monitor your progress as you work through the lessons and complete the course. If you happen to fail a module, don’t worry, you will be given the opportunity to re-submit your assignment after a little extra coaching. There are no final examinations. As soon as your last assignment has been graded you will be able to view your final grade in the grade book. Your final grade is calculated by taking the average of your ten grades for the ten assessed modules. This will be the grade shown on your Certificate in TESOL. INTESOL was the first TESOL/TEFL training provider to offer its Online Cert TESOL trainees a full week of observed teaching practice. We have subsequently been able to develop a practice that will significantly enhance your skills and confidence not only in the classroom, but also during job interviews. As part of the INTESOL Online Certificate in TESOL you must attend one of our TP centres for a full week of teaching practice or take our Online Teaching Practice. Trainees, who have been taught how to manage classes and set up one to one teaching sessions; have been given a sound introduction to materials and visual aids production and have gained confidence in planning lessons, are given the opportunity to observe experienced teachers and to produce a portfolio of lesson plans and observation assessments. Our trainees are then observed teaching several levels, both in groups and on a one to one basis. have a personal mentor to guide you throughout your practice. observe experienced, qualified teachers in a real language school. produce a portfolio of lesson plans. receive detailed feedback and observation assessments. 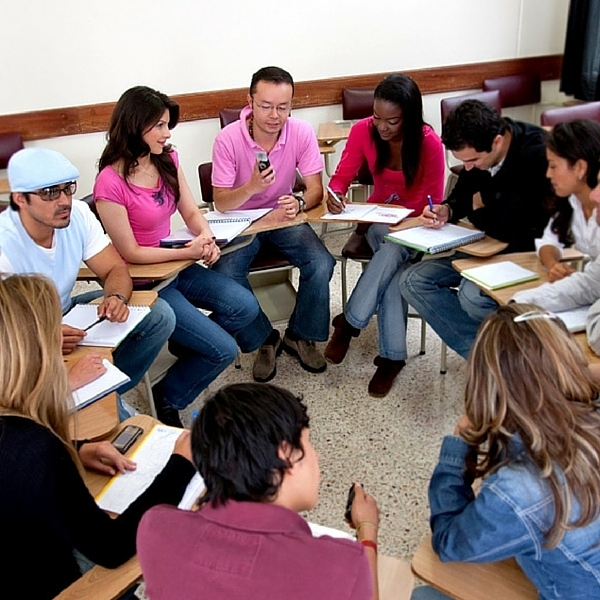 gain experience teaching real ESOL students of several levels, from beginners to advanced. The students you will be teaching travel to the UK from a variety of locations throughout Europe, the Far East and the Middle East. be observed teaching both groups and on a one-to-one basis. gain significant confidence in the classroom. For 8 hours per day, Monday to Friday you will be involved in observation, lesson preparation and teaching. By the end of the practice you will have completed at least 6 hours of observed and assessed teaching practice which satisfies the British Council requirement. Starting day is Monday. The Teaching Practice component of the Certificate in TESOL is available all year. You will be able to choose your centre later in the course. Please note: The Onsite Teaching Practice is a one-to-one course with your personal mentor for the week. You will have gained all of the theory before you take any teaching practice, plus you will practice on real students in a real language school not on your peers or fellow students. A low-cost, time effective format and accessible by anyone wherever they are in the world is the INTESOL online Teaching Practice. All you need is a computer, webcam, headset and fast internet connection (see below for technical requirements). You will be given lessons to prepare. Your lesson plans and materials will be emailed to the Director of Studies in the school whose students you will be teaching. You will be asked to suggest dates, and lessons will be arranged at times mutually convenient for you and the school. You will be able to decide whether to do your lessons on the same or different days. You will also have the option of planning and delivering just one group initially so that you can draw on the experience to plan the following group. You will be expected to plan 6 lessons of 40 minutes each. You will be sent details of the lessons you must plan. At the beginning of the TP, the tutor will have a quick word with you and after you have been introduced to the students the tutor will remain off screen. All your lesson materials will be printed out ready for the lessons; you will be able to ask the tutor to assist by handing out materials, showing flashcards etc. At the end of the TP you will be asked to reflect on the practice and for oral feedback. Full oral feedback will then be given by the Director of Studies or tutor. The INTESOL Online Teaching Practice is a totally flexible, convenient method of earning a CELTA/Trinity equivalent TESOL qualification COMPLETELY ONLINE! Desktop/Laptop PC: Intel Core2 Duo processor or better (no netbook or tablet). Internet Explorer web browser: Version 9 or higher. Wired internet connection: Cable, DSL, or Fiber Optics (no wireless connection). Webcam: Either built-in or preferably high quality Creative, Logitech, or comparable. Headset: Microsoft LifeChat LX-3000 preferred, or any headset with sealed headphones and a swivel boom microphone (EXCEPT Logitech USB headsets). Every session you teach must be treated as if you are teaching a regular class. any noise should be audible in the room when you are teaching. Also, your background must be a plain background. Most teachers will arrange their desks so their backs are facing plain walls (no doors, pictures, windows). Other teachers put up a white curtain or sheet to create a plain background. This is very important as this will facilitate a professional image of you and also allow the clients to focus on your teaching. (not assessed) – how best to organise your study time. Module 4 – Visual Aids; study of all the audio-visual aids available – production of your own flashcards and aids to be used with a simple flannelgraph. Module 5 – Error – looking at authentic student errors, classifying them, using a correction code, producing remedial exercises and improving your own practice. NB The 190 Hour course is the same plus teaching practice. What’s included in your course fee? Invaluable real world teaching practice before you start your teaching career! No extra fees to pay if you need extra time. You take as long as you need. Please note: There are no set start dates and no time limit. You decide when you start. You will be given a username and password to access your course. Whilst we make every effort to ensure that the information on this site is accurate and complete, third parties supply some of the information to us and we are not able to check the accuracy or completeness of that information. We do not accept any liability arising from any inaccuracy or omission in any of the information on this site or any liability in respect of information on this site supplied by you, any other site user or any other person. You may only use this Site for lawful purposes when using the companies' services. You must not under any circumstances seek to undermine the security of the Site or any information submitted to or available through it. In particular, but without limitation, you must not seek to access, alter or delete any information to which you do not have authorised access, seek to overload the system via spamming or flooding, take any action or use any device, routine or software to crash, delay, damage or otherwise interfere with the operation of this Site or attempt to decipher, disassemble or modify any of the software, coding or information comprised in the Site. You are solely responsible for any information submitted by you to this site and to any branch of INTESOL. You are responsible for ensuring that all information supplied by you is true, accurate, up-to-date and not misleading or likely to mislead or deceive and that it is not discriminatory, obscene, offensive, defamatory or otherwise illegal, unlawful or in breach of any applicable legislation, regulations, guidelines or codes of practice or the copyright, trade mark or other intellectual property rights of any person in any jurisdiction. You are also responsible for ensuring that all information, data and files are free of viruses or other routines or engines that may damage or interfere with any system or data prior to being submitted to this site. We reserve the right to remove any information supplied by you from the website at our sole discretion, at any time and for any reason without being required to give any explanation. We will use information supplied by you (including, without limitation, sensitive personal data) to aid the application process and associated administrative functions. This involves us, amongst other things, processing and storing information (including, without limitation, sensitive personal data). We may collect and aggregate data from the information supplied by you to help us to understand our users as a group so that we can provide you with a better service. You consent to us using information provided by you (including, without limitation, sensitive personal data) in each of these ways. We accept no liability for any loss (whether direct or indirect, for loss of business, revenue or profits, wasted expenditure, corruption or destruction of data or for any other indirect or consequential loss whatsoever) arising from your use of the site or services offered by the companies, and we hereby exclude any such liability, whether in contract, tort (including for negligence) or otherwise. We hereby exclude all representations, warranties and conditions relating to this website and your use of it to the maximum extent permitted by law. You agree to indemnify us and keep us indemnified against all costs, expenses, claims, losses, liabilities or proceedings arising from use or misuse by you of this site. You must notify us immediately if anyone makes or threatens to make any claim against you relating to your use of this site. The use of this website is to be governed by and construed in accordance with English law. The courts of England are to have exclusive jurisdiction to settle any dispute arising out of or in connection with the use of this website or any agreement made through this website. Some of the goods or services offered through this website may be governed by laws in countries other than England and separate conditions will be applied for these. BY COMPLETING THE REGISTRATION PROCESS I HEREBY AFFIRM THAT I AGREE TO BE BOUND BY ALL OF THE "TERMS AND CONDITIONS" AS DETAILED BELOW. This is an agreement between INTESOL Worldwide Ltd. and myself, the applicant. Once enrolment on a course is completed by paying the course fees in full, first instalment or deposit and/or access to online materials has been given, the course fees are non-transferable from online to onsite courses or vice versa. Once enrolment on a course is completed by paying the course fees in full or deposit, the course fees are non-transferable from one centre to another without loss of deposit. Course fees for all online courses and onsite course deposits are collected in GBP. Remaining course fees for all onsite courses based in Europe are collected in Euros. Remaining course fees for all onsite courses in the Americas are collected in American $. Acceptance onto an online course is at the sole discretion of the Course Director. If payment has been received and the application is subsequently declined a full refund of fees paid shall be provided. Course payments cannot be transferred from one student to another. Non-native English trainees must have a good command of both written and spoken English. An IELTS score of 6 is generally required. Course materials may be returned within 14 days of the date the full course fees or first instalment was received by INTESOL, provided no assignments have been submitted for assessment. Students can expect a full refund, minus postage where relevant, without stating a reason provided the materials are returned in good order so that we can resell them. The cost of damaged materials will be deducted from the refund total. The refund is usually issued within 14 days of the return and will paid by the same method as the original payment. No refunds can be given after 14 days of the course payment for any reason, except in the circumstance when it is deemed necessary to advise a trainee of his or her unsuitability to continue, possibly due to work of an unacceptably low standard. In this case the trainee must have submitted at least the first 3 modules for assessment. All applicable discounts must be claimed at the time of application and must be clearly stated on the application form. Evidence of eligibility for discount must be provided within 14 days of application and will only be deducted from the course fees when this evidence has been received by INTESOL. Student (must be full time)- Photocopy of student card showing attendance in the current academic year OR student number with name of University. Registered unemployed - Photocopy of recent letter from authorities confirming you are registered unemployed. i.e. Letter regarding Jobseekers Allowance. Multiple applicants - The name(s) of the friend(s) with whom you are enrolling must accompany the application form. The multiple discount will be deducted from each applicant when all multiple applicants have enrolled. You will be assigned a personal tutor for the duration of the course. Your personal tutor can be contacted by email. INTESOL tutors are practising ESOL teachers and teacher trainers, and are generally unavailable during the day. Should you have any questions that need to be answered quickly you can email the Course Director on lynda@intesoltesoltraining.com or call 016060871001. This service is available 9am - 5pm GMT, Monday - Friday. Course materials will usually be made available within 48 working hours of receipt of your first instalment or full course fees. If you have paid by cheque your materials will be dispatched as soon as the funds have cleared. Course materials are delivered online in a downloadable format. Teaching practice centres are real language schools where you can gain the Teaching Practice Certificate. They are independent English language schools that run English language courses for foreign students all year round. Although the teaching practice centres operate INTESOL courses they are not owned by INTESOL. A non-refundable deposit of £100 or £120 or the full course fees must accompany your application to secure a teaching practice place at one of our centres, made payable to 'INTESOL Worldwide Ltd'. Please note: You will not be allowed to start your teaching practice unless your course fees have been received in full. Cheques are not acceptable on arrival. Should it be necessary to change the date or centre of your teaching practice 28 days or more before your teaching practice start date you will not be charged a cancellation and rescheduling fee. Any course fees paid will be transferred to your new start date or centre. If you wish to change the date or centre of your teaching practice within 28 days of the start date you will be required to pay a cancellation and rescheduling fee of £50 before the new date is confirmed. Any course fees paid will be transferred to the new centre or start date. If you fail to show for your teaching practice programme you will forfeit your deposit of £100 or £120, and will be required to pay this deposit amount again if you wish to reschedule. Should you need to cancel your teaching practice any course fees paid will be refunded minus the £100 or £120 non-refundable deposit. All accommodation is arranged by separate agreement between you and the host family or guesthouse. If you have chosen to include accommodation with your teaching practice it is at the sole discretion of the host to make any charges they feel necessary following cancellation, change of date or change of centre, regardless of when the cancellation/change is made. All participants must understand that they may be charged for unused accommodation, particularly in busy periods or location, i.e. summer months, London. Please note: If booking accommodation in London in particular, most host families will charge the full amount should you change your date or cancel your course. INTESOL cannot be held repsonsible for any accommodation charges as a result of changes or cancellations. All changes/cancellations must be made by calling 01606 871001 or emailing lynda@intesoltesoltraining.com. telling us what the problem is. We will reply to your e-mail/letter within 7 days (Monday to Friday, excepting public holidays). In the reply it will specify what action is being taken to rectify the problem and how long this will take. You will be kept fully informed throughout the process. Any agreements entered into with INTESOL WORLDWIDE LTD based in the UK are to be governed by and construed in accordance with English law. The courts of England are to have exclusive jurisdiction to settle any dispute. This is an agreement between the INTESOL Centre, hereafter referred to as "The Company" and myself, the applicant. My health, safety, and/or my general welfare, are not the liability of "The Company" and neither are my personal effects. I agree to provide my own health and accident insurance and not to hold "The Company" responsible for my health, injury, or death at any time prior to, during, or after completion of the course. I further agree to make such determinations, preparations, and arrangements, including the purchase of supplemental insurance on my own, as necessary to secure my entry, extended stay, and general well-being or as may be required by the law of the country in which I will reside. If I have a medical condition that could potentially affect my attendance, training, or the training of my peers I will notify "The Company" in advance. Additionally, should I fail to do this, of any medical condition that could inhibit my training or the training of others I agree that my offer of acceptance to the course, even a current course, may be withdrawn without refund. I am responsible for obtaining an appropriate Visa, where required, prior to my entrance into the relevant country. If I am required to obtain a Visa, I shall contact the appropriate Embassy or consulate for conditions of the visa and obtain an appropriate Visa prior to my entry. Additionally, I understand that obtaining a work permit is my responsibility or the responsibility of my future, potential employer and that either I or the future, potential employer will be the entity responsible for securing this on my behalf. I agree to be punctual for every class, and for any such required meetings or assigned meetings that relate to my class work and that may not occur during the designated class time. Tardiness will be grounds for dismissal from the course. I agree to 100% attendance. Absences may be made up at the discretion of the Course Director. I understand that unprofessional manner, or manner that is not in accord with the local culture or environment, will be grounds for dismissal from the course without recourse. I understand that I must successfully pass all components of the course within four weeks of the final date of the course in order to be eligible to receive the certification. In the event that I do not pass the course I understand it may be possible to retake components of the course at the discretion of the Course Director, however, additional fees may apply. I understand that "The Company" is not a placement agency, but does offer job guidance assistance to all successful graduates. "The Company" will provide me with advice and direction, direct me to appropriate contact persons or organisations, and/or whenever possible schedule interviews on my behalf. I agree to present myself in a professional manner according to the culture and academic standards of teachers in the local environment to prospective employers. In the unlikely event that I experience difficulty in finding a job teaching English, "The Company" will provide further assistance and advice, such as providing in depth consultation regarding my approach to prospective employers, following up on my interviews, and helping to arrange additional job interviews whenever possible on my behalf. I agree that "The Company" may assist me in arranging accommodation. I agree that if I accept this assistance I have no recourse against "The Company" with respect to location, quality, cost, or otherwise as it relates to the place of residence arranged by "The Company". "The Company" shall not be liable for any losses, damages, or injuries to persons or property that may occur at any accommodation arranged through "The Company" or otherwise. In the event I choose to terminate my accommodation prior to the relevant check out date, no refund will be given. I understand that after I have submitted my application to "The Company", if I am accepted, I will initially receive a letter of "general acceptance". I may reserve a place on a particular course date once I have submitted my non-refundable deposit. If I cancel or reschedule the course less than 28 days prior to the start date, no refund whatsoever is given. However in such a case, I have an opportunity to transfer my deposit and total tuition and housing fees paid to a future available course. If I withdraw at least 28 days prior to the start date, my fee is refundable less the deposit which is non-refundable. I understand that I have an opportunity to reschedule my participation in the course and apply my deposit to a future available course, within 6 months of the original course date. Upon rescheduling, assuming availability, I shall pay a penalty of 125 Euros. I certify that when I make payments to "The Company" for any services or offerings I am doing so using my own personal funds. If I am using the funds of a third party, I hereby state that I have been given the authority to act on behalf of third party to request authorisation of such transaction. Additionally, I understand that I am responsible for all damages, bank fees, credit card fees, or penalties that may be associated with the unauthorised use, transfer, or disclosure of credit or bank account information (e.g. charges associated with frozen funds, disputes, reversals, refunds, legal fees, court fees, or any applicable penalties).After I have made the required deposit to secure my place on the course, I may make remaining payment(s) in any increment(s) and at any frequency that is convenient for me, providing that the entire balance is paid in full at least 28 days prior to the start date of the course. I understand that failure to pay in full at least 28 days prior to the start date of the course may result in me not being able to attend said course. I agree that I have not knowingly misrepresented myself to "The Company" or its authorised representatives in any way. I also agree that I have disclosed the true disposition of any past, pending, or potential future criminal status. Additionally, I acknowledge that the application essays and skill-based questions are my own true, authentic, and original works. I understand that submitting falsified or plagiarised works to "The Company" and its representatives may be grounds for immediate withdrawal of acceptance offer, ineligibility for any future course, or dismissal from a current course in which I am enrolled without refund. Additionally, I understand that I must be 18 years of age by the time I actually commence my course study. I will also provide "The Company" with the emergency contact information of a relative or significant other who would be able to advise "The Company" about the management of my welfare in the event of an emergency or situation where I cannot act on my own behalf. The contact information for that person shall consist of his/her telephone numbers, email addresses, and the postal mailing address where he/she may be reached. Additionally, I will not at any time hold "The Company" liable for the exchange of personal information between an authorised company representative and my designated emergency contact should such exchange be necessitated to promote my well-being. I understand that if I fail to do so, "The Company" is limited in its role to assist me in the event of an emergency. During my training session, I agree to be behave in a courteous and professional manner with my fellow trainees, trainers, administrative staff, or any person associated with "The Company". Inappropriate conduct, abuse, or damage to school or vendor property will be grounds for immediate dismissal from the course and housing obtained from "The Company". No refund or any portion thereof will be given In such a case, the decision of the Company is final. I understand that the information contained in all electronic correspondence, including the "The Company" website, and in printed material is believed to be accurate. However, I understand that it may be subject to errors, changes, omissions, availability of courses, or withdrawal of special offers without notice. It is the responsibility of the applicant to contact an official representative of "The Company" for periodic updates as terms of this course offering are subject to change without notice. Additionally, I understand that it is my sole responsibility or responsibility of my authorised representative to check for all continuous email correspondence from "The Company". All official correspondence shall be conducted via email unless the applicant otherwise indicates on the application or in written form that this is not a suitable mode of communication. Should my email address or pertinent contact information change, I shall notify "The Company" within a reasonable amount of time. These Terms and Conditions shall be construed in accordance with and governed by the laws of the appropriate country. Any action, claim or proceeding seeking to enforce any provision of, or based on or arising out of, these Terms and Conditions may be brought against any of the parties in the courts of the appropriate country. By execution and delivery of these Terms and Conditions, I hereby irrevocably accept, generally and unconditionally, the exclusive jurisdiction of the aforesaid courts and waive any objection to venue laid therein. Process in any action or proceeding referred to in the preceding two sentences may be served on me anywhere in the world.